Like Night And Day: How Utilities In California And Georgia Approach Solar As homeowners embrace solar, utilities are making less money, and that's shaking up their business model. Companies in California and Georgia are handling the growth in dramatically different ways. 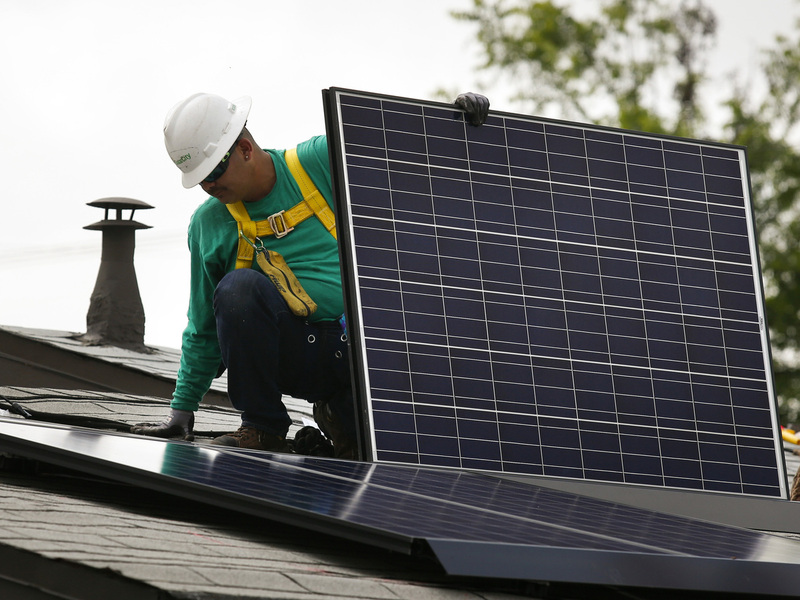 A SolarCity employee installs a solar panel on the roof of a home in Los Angeles in 2014. 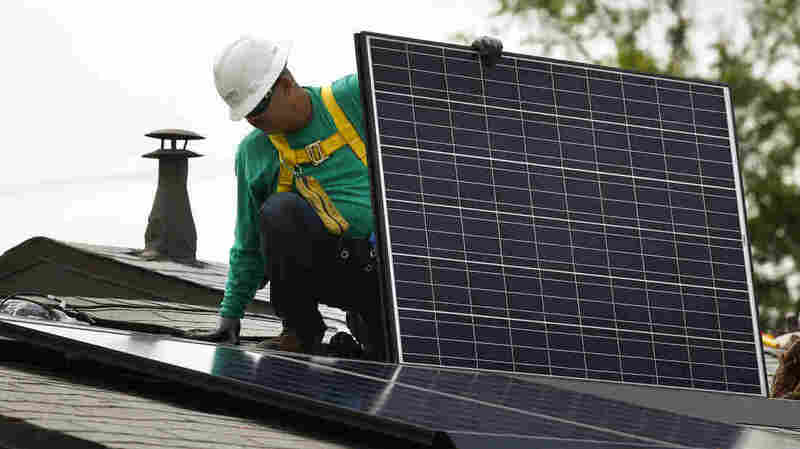 California's utilities want to pay new solar customers less for their extra electricity and to add new monthly fees. This was a record-breaking year for rooftop solar power. It's booming across the country. But as more homeowners make their own power, electric utilities are making less money, and that's shaking up their business model. Utilities in two states — California and Georgia — are handling the growth of solar in dramatically different ways. Matt Brown recently got solar panels on his Oakland, Calif., home, but it's dark out right now — his panels aren't working. So Brown's appliances are running on electricity he's buying from his utility, Pacific Gas & Electric. So even with solar panels, you might think his utility bill is pretty high. "Right now we're projected basically to have a zero bill," he says. Zero dollars. That's because during the day, when Brown's panels are cranking out electricity, he sells the extra back to PG&E. The power he sells cancels out the power he buys. That's what makes solar so financially attractive — at least, for him. "It is going to be a challenge for the utility," says Aaron Johnson, a vice president at the utility. PG&E is home to a quarter of all the rooftop solar systems in the country, and a new one comes online every seven minutes. To handle that, Johnson says, today's electric grid needs an upgrade. "As we begin to build that modern, 21st century grid, everyone's going to have to contribute to that," Johnson says. "And we think solar customers need to contribute to that." 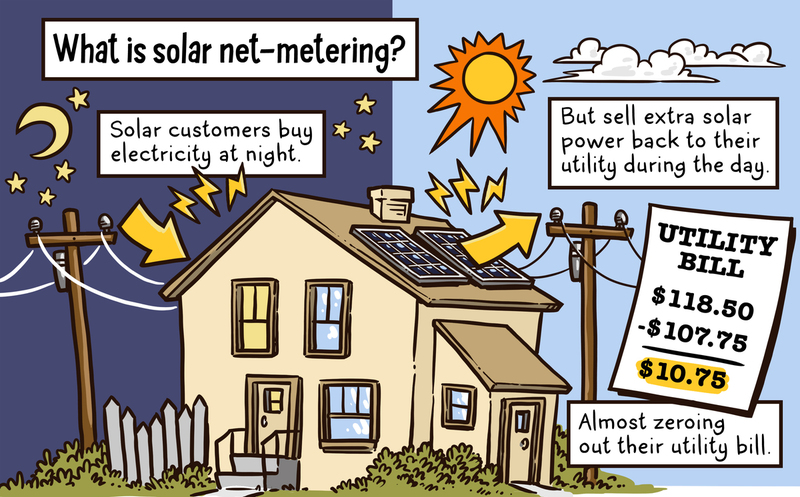 He's saying with their low bills, solar customers aren't pitching in enough. That's creating a shortfall that PG&E says will reach almost $3 billion a year within a decade. So California's utilities want to pay new solar customers less for their extra electricity and to add new monthly fees. "That argument can only come from a monopoly that is used to selling every electron to every customer for the past 100 years," says Walker Wright at Sunrun, one of the largest solar companies in the country. 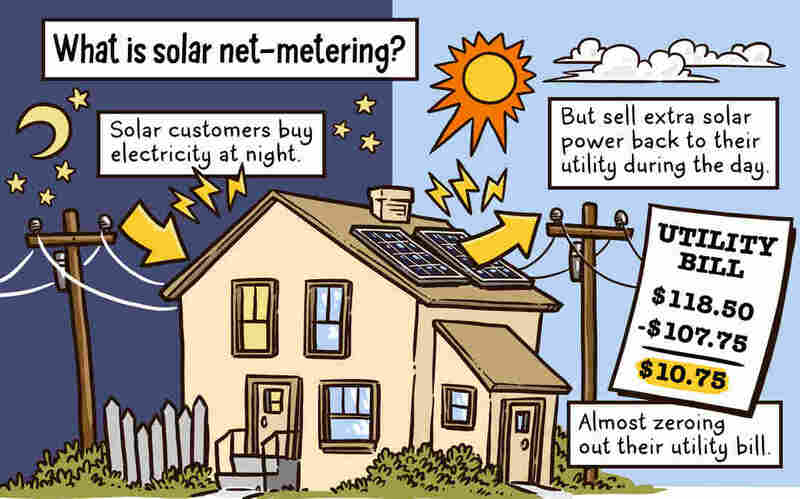 "What rooftop solar represents is the first true form of competition." Wright sees the proposed fees as a direct attack on the solar industry. The same thing happened in Arizona, where a utility recently started charging its solar customers $50 a month. "We saw a 95 percent drop in the applications for solar," Wright says. "We saw absolute devastation in the market, and it's created a lot of anxiety." That's not something California wants to do, Wright argues, when the state has big renewable energy goals. Whatever California regulators decide, the state makes up more than 40 percent of the country's solar market — so the precedent set here could spread nationwide, says Brian Chin, a utilities analyst with Merrill Lynch. The business model has to change in the next 15 years in some way, shape or form. "A lot of times these states all kind of look at each other and go, well, if they can do that and it's reasonable, then we can do it too," he says. Chin says it just shows how solar is disrupting the way electric utilities do business. "You look at the business model, and you can't help but go: The business model has to change in the next 15 years in some way, shape or form," he says. That's why utilities in some other states are trying a different approach to solar. 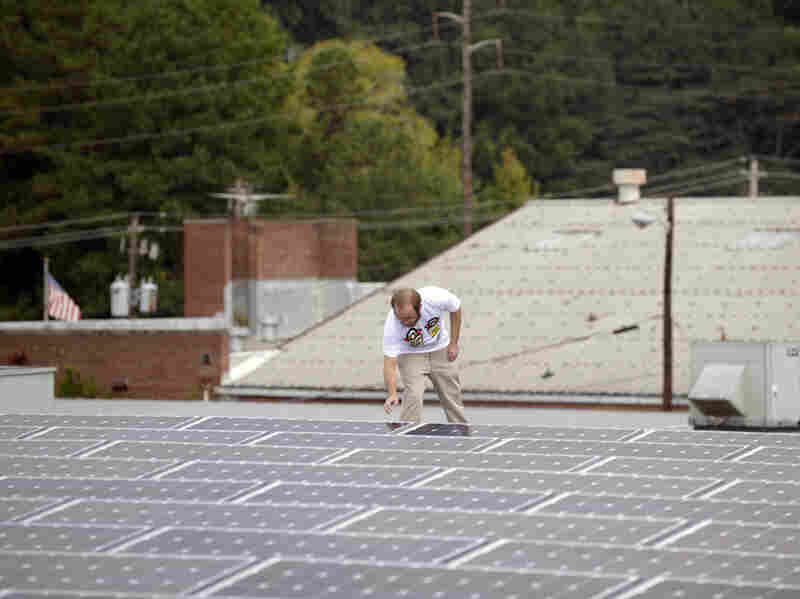 Georgia Power, that state's biggest utility, is getting into the rooftop solar game itself. The company will evaluate your house, to see if you're a good candidate for solar panels, and it will even get them installed for you. "In case our customers do want to add rooftop solar, we want to be there to sell it to them," says Jacob Hawkins, a spokesman for Georgia Power. The utility launched the rooftop part of its business about six months ago. But in general, unlike some other utilities, Georgia Power isn't acting like rooftop solar panels are a threat. Mike Easterwood checks one of the solar panels installed on the roof of his self-storage business in Decatur, Ga., in 2013. The state has begun to embrace solar but it represents a fraction of the state's power generation. "We look at it not as necessarily something brand new, but an evolution of something that we've always done," Hawkins says. Now, there are a few important differences between Georgia and California when it comes to solar. Electricity costs less in Georgia, so it makes less financial sense for people to get rooftop solar panels. When residents do have solar panels on their roofs, the utility doesn't pay as much to buy the extra energy generated, as it would in California. But solar is growing here. "I believe Georgia Power's made great strides," says Jason Rooks, a lobbyist in Georgia for the Solar Energy Industries Association. He says just a few years ago, "I remember, down at the capital, hearing that solar won't work in Georgia because it's too cloudy, too much humidity in Georgia, and then of course it was too expensive." He says that mood started to shift thanks in part to the Georgia Public Service Commission, which regulates utilities. "When I ran for office I promised to try solar myself," says Tim Echols, one of the commissioners. He says that taught him a few things, "with the first lesson being: Don't put solar on a house in the shade." Echols says the commission brought Georgia Power to the table and directed the company to add more solar power, especially with solar farms. But Echols wasn't in any rush to do that. "Our commission is all Republican, and we wanted to make sure this would work financially," he says. That all means the state has been slow to adopt solar, especially rooftop solar. Jason Rooks, the solar industry lobbyist, says that's not necessarily been a bad thing. "In hindsight, there's a benefit to that, even as a solar advocate, that we haven't had the trial and error of early adoption," he says. Solar is still pretty tiny in Georgia. It accounts for about 1 percent of all the energy generated in the state, and rooftop solar panels — as opposed to large solar farms — are only a tiny percentage of that. But there's a lot of potential. And with the utility here embracing rooftop solar, it may be forging a different path than states like California. Lauren Sommer is a reporter with member station KQED; Molly Samuel reports for member station WABE.